England’s 15 Patient Safety Collaboratives (PSCs) play an essential role in identifying and spreading safer care initiatives from within the NHS and industry, ensuring these are shared and implemented throughout the system. Deliver the national mandate locally, recognising the local context and health and care architecture. Find out more at www.ahsnnetwork.com/patient-safety-collaboratives/. Safety and ensuring patients are not harmed within a health and social care setting is everyone’s responsibility and Greater Manchester is in a unique position to be able to support and create a smooth pathway to improvement. Through the Patient Safety Collaborative, a joint initiative funded and coordinated by NHS Improvement and delivered by Health innovation Manchester, we can work directly with local teams, supporting them to make sure they have the right skills and resources to implement improvements. We can also share good practice across the health system, focus on people-centred care and build relationships with NHS staff, business and academia to stimulate innovation and improvement. 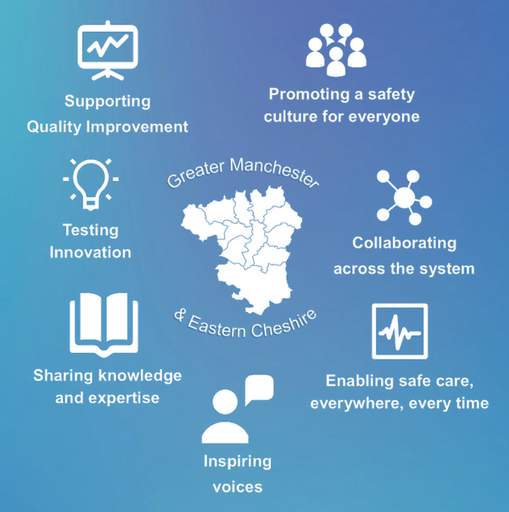 The PSC has been set up to support, connect and provide initiatives and activities to drive improvement and ensure patient safety is embedded throughout the Greater Manchester health and social care community. Deteriorating Patient: To reduce harm and enhance the outcomes and experience of patients who are deteriorating. Culture and Leadership: To help create the conditions that will enable healthcare organisations to nurture and develop a culture of safety. Maternity and Neonatal: To improve maternity and neonatal care, specifically reducing the rate of stillbirth, neonatal death and brain injuries occurring during or soon after birth by 20% by 2020. The GMECPSC host interactive learning system events with speakers, activities and information sharing across its workstreams. To access information, resources and details of previous GMECPSC learning system events please click the links below. 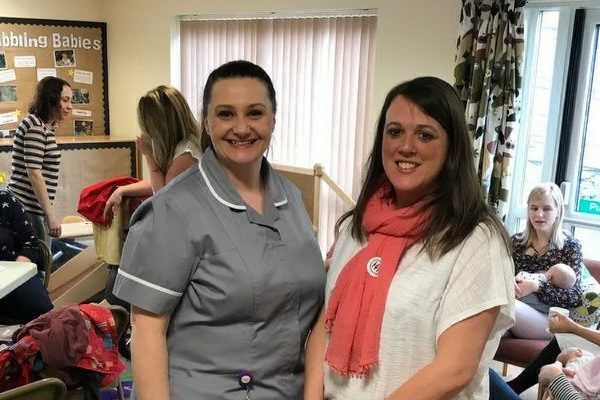 When Gillian Bardsley had a poor experience giving birth to her daughter Jessie in February 2017 following an induction at the Royal Oldham Hospital, she was inspired to bring about change for other women. Gillian was left with PTSD symptoms and wrote a letter of complaint which resulted in a meeting the hospital’s Head of Midwifery at the time where she shared her experience. Gillian was then put in touch with Patient Experience Midwife Sam Whelan, learned about the plans to improve the department and quickly became engrossed in the drive for change, appearing in a patient experience video which was used for training with the maternity department. She then began to share her story on a wider stage, including speaking at NHS Improvement Conferences in Manchester where she met Debby Gould, GMEC PSC Clinical Lead, Maternity and Neonatal. Gillian continued: “I attended one of the PSC learning system events and found it interesting to learn more about the activities going on to improve birth experiences. Gillian has also worked with Sam to set up and chair a Maternity Voices Partnership for Rochdale and Oldham. The group, which is supported by Health Innovation Manchester, aims to give women the opportunity to help co-design and improve local maternity services. “I am happy to report that more and more women are getting involved with the group and we are going to carry out the 15 Steps for Maternity initiative which is aimed at reporting on first impressions and delivering ideas for how we could improve things from a woman’s point of view,” Gillian said. “The PSC have been great supporters of the group, attending our launch event, helping with materials to display at the hospital and encourage women to get involved. “The impact of this on me has been a healing one, I feel that being heard, and having the opportunity to give back is part of the reason why I have been able to recover from the effects of the birth. Sam added: “Health Innovation Manchester and the PSC team were a fundamental point of contact for making links with other Health Professionals across the area and supported the set-up of the Rochdale and Oldham Maternity Voices Group. “It is fundamentally important that women’s voices are heard and suggestions for change are made so that continuous improvement can occur. “Together Gillian and I forged a way to launch the group in May and I am looking forward to the group taking part in the ‘15 Steps’ initiative on the maternity unit at The Royal Oldham Hospital.